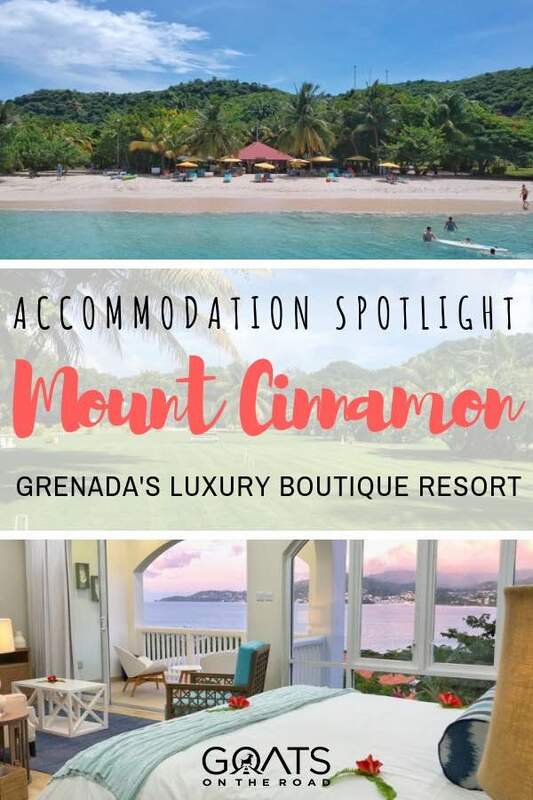 We were recently invited by Mount Cinnamon Grenada to spend a couple of nights and experience the award-winning boutique resort. 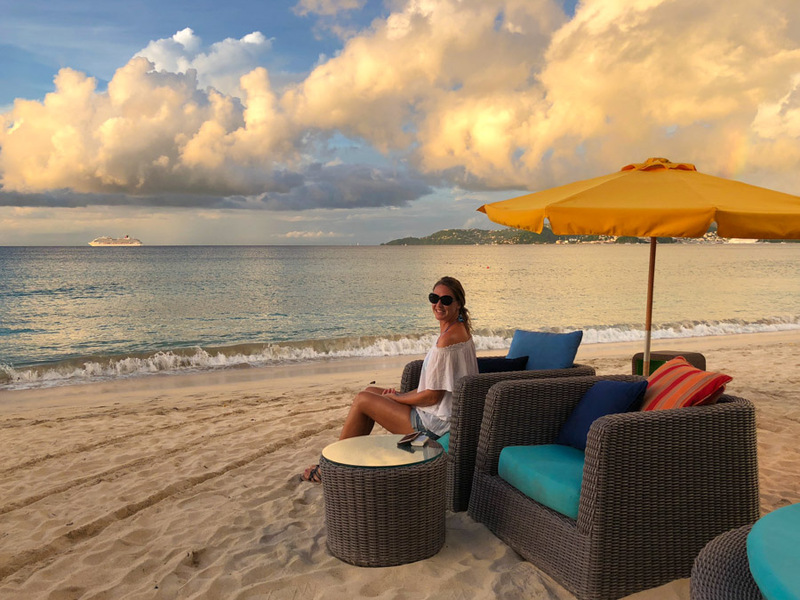 Although we already live on the island, it was a great opportunity to have a little “staycation” and celebrate my birthday at one of Grenada’s most highly rated properties. 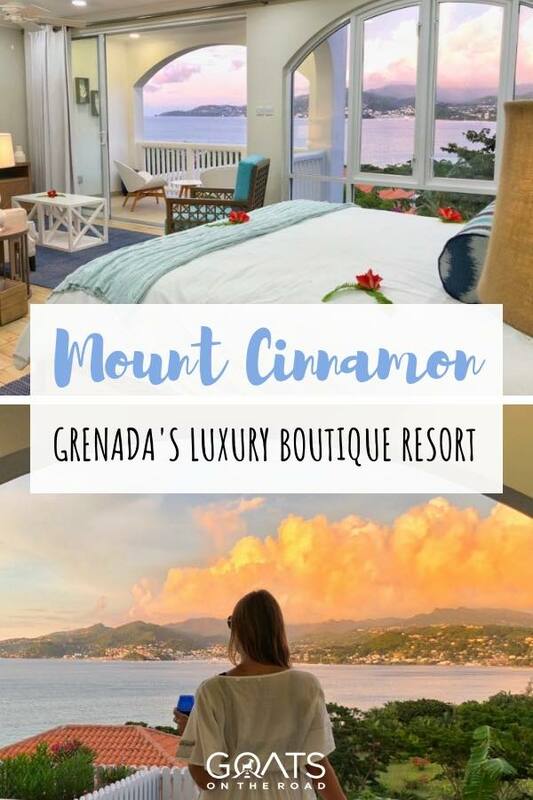 Ever since we first arrived in Grenada in 2014, we’ve always wondered what the rooms are like at Mount Cinnamon. Climbing up the hill behind the azure waters of Grand Anse Beach, the white-washed hacienda-style villas and suites have stunning views over the Caribbean Sea. Close enough to everything, but secluded enough to fall asleep to the sound of tree frogs at night, this was the perfect place to get away and relax for a couple of days. If you want to travel to Grenada and stay in a luxury boutique hotel, then this article is for you. In this post I’ll break down every aspect of our stay so you can decide if Mount Cinnamon is right for you. Don’t miss the video at the end of this post! Note: While we were hosted by Mount Cinnamon for this stay, we aren’t obligated to write in a positive way. We’re always 100% honest in our accommodation spotlight articles (and every article on our website) and will point out negative experiences if we have them, despite any complimentary stays or services received. All thoughts and opinions are always our own on this blog. When we arrived at Mount Cinnamon Grenada, we were immediately greeted by name. No one ever pronounces Dariece’s name correctly, so we were pleasantly surprised and immediately felt welcomed when the staff at the hotel nailed it. We assumed this first-name basis was because we are bloggers and the staff were expecting us, but I soon learned that the staff address every guest by their first name. Each morning there is a team meeting and a list of the arriving guests are given out to the staff members, so that everyone is aware of who they will be expecting. To us, this really made our entrance into Mount Cinnamon an intimate one, and we felt like we were arriving at a friend’s home. 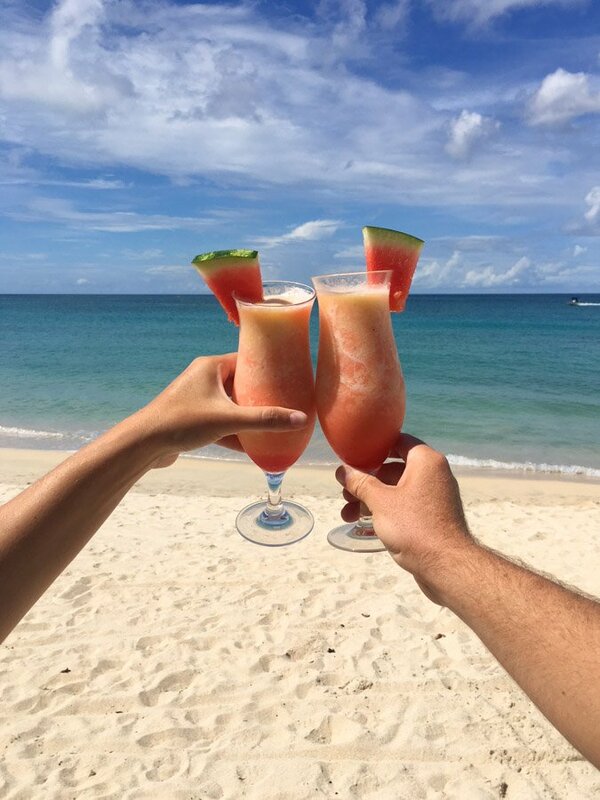 After leaving our luggage at the front desk, we were whisked away to the bar, which is set next to the pool and onsite, open air restaurant – with views of Grand Anse beach through lovely Spanish arches. 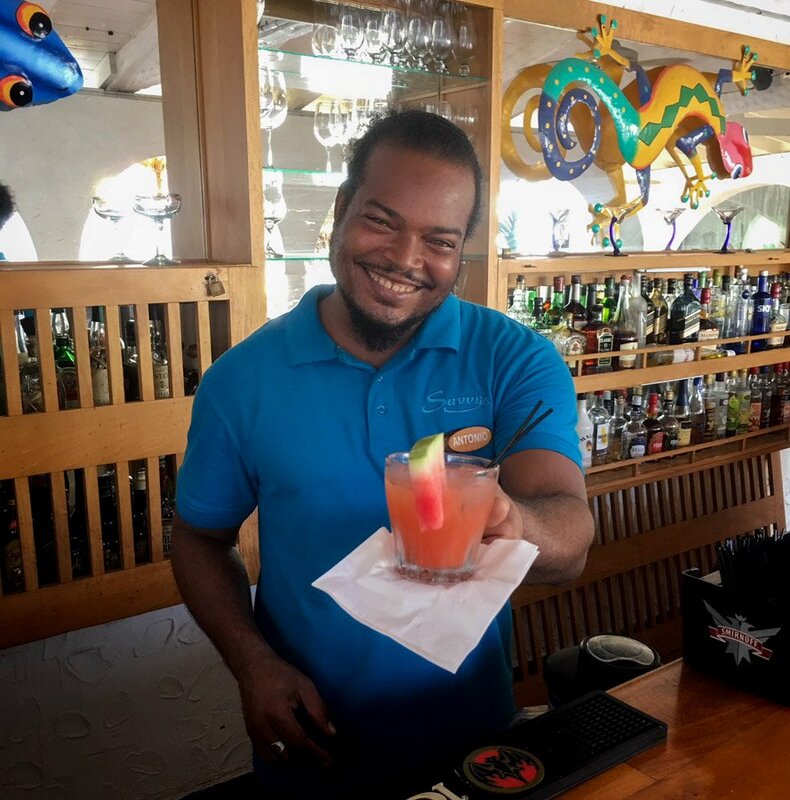 We sat down and were offered a flavourful homemade rum punch by Antonio, perhaps the best we’ve had yet on the island (and we’ve sampled a lot!). Being offered a rum punch from Antonio upon check-in, what a great way to arrive! It was such a wonderful, relaxed way to arrive at the hotel. A container of pink’ish brew with the famous spices of Grenada soaking inside was brought from the fridge for us to have a look at. 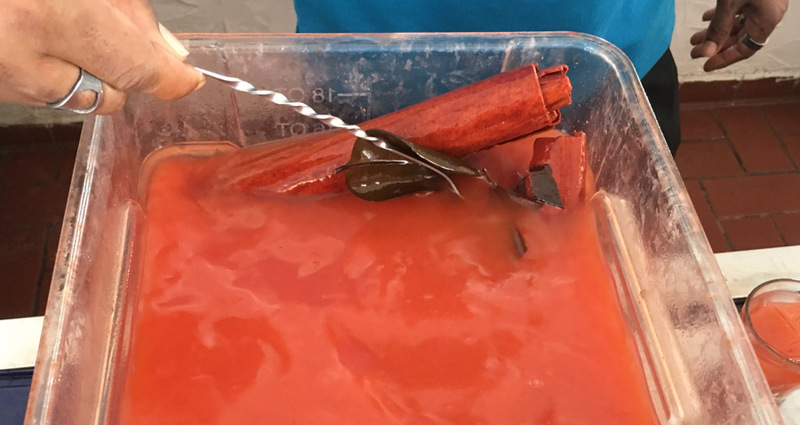 Although the secret ingredients weren’t disclosed to us, we spotted fresh cinnamon bark, bay leaves and nutmeg. Just as we finished our last sip of the rum punch (and felt a little buzz on our empty stomachs) we were taken to our room by Amica, who pointed out local plants and flowers along the (short) walk to our suite. Since we were staying in one of the newly built Cinnamon Suites, we were expecting a nice room. 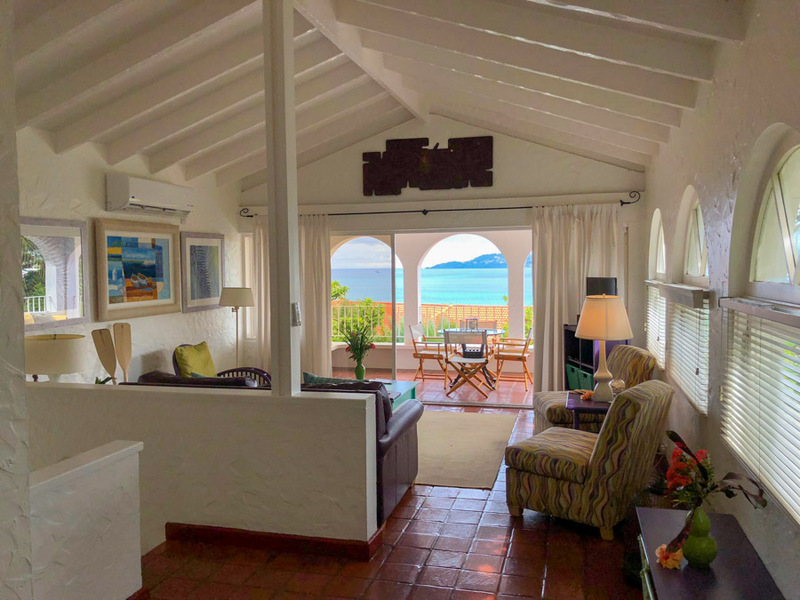 But, when Amica turned the key and opened the door, we were blown away by the sweeping view across the Caribbean Sea, the city of St. George’s, and the lush hills beyond. Fire-red flamboyant flowers were tastefully placed on our bed and end tables, adding to the welcoming nature of the room. 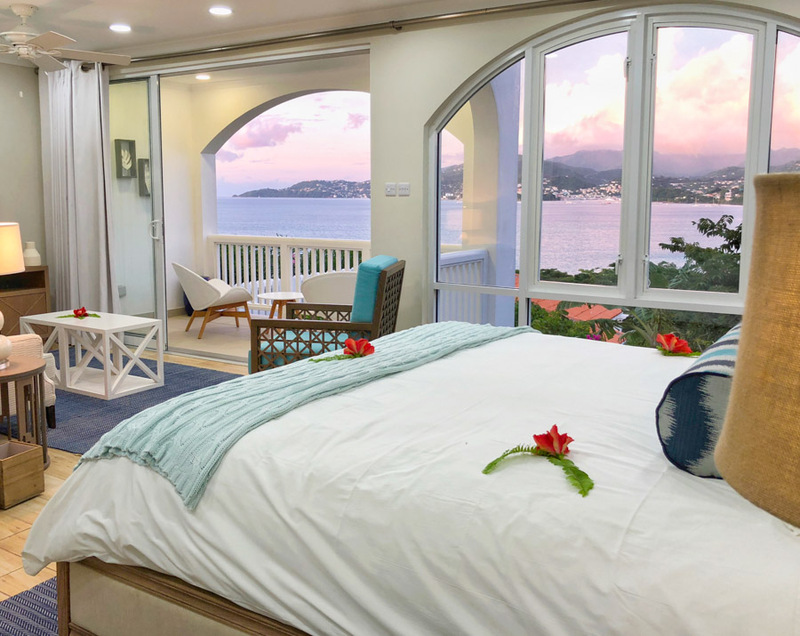 The Cinnamon Suites are perched on the hillside offering panoramic views of the island through the curving arches of the floor-to-ceiling windows. The room is modern and stylish with a beach house vibe, lovely furniture, beautiful artwork on the walls and colourful touches throughout. Our suite was spacious (500 square feet) and welcoming with a very comfortable king sized bed and a large, modern bathroom. A sitting area was available as well with a sofa adorned with royal blue pillows, a flat screen TV and chair with turquoise cushions. It was obvious that the colour palette of our suite was meant to represent the sea and sand – which it definitely accomplished. We opened the mini fridge to find a variety of local fruits, and baked goods made in-house. With a piece of papaya (paw-paw) in one hand and banana bread in the other, we went straight to the deck to admire the spectacular view. 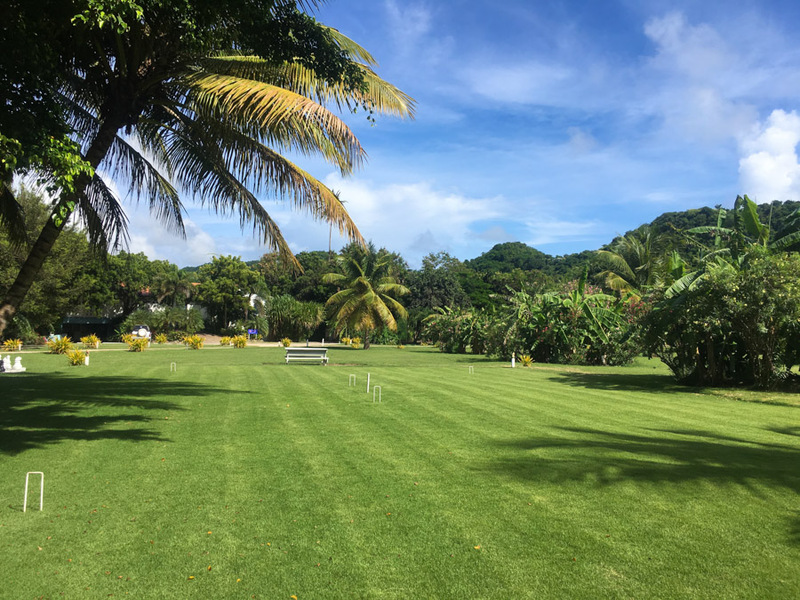 It was actually hard to pull ourself away from our room during our stay, but luckily, the restaurant, the common areas and pretty much every area at Mount Cinnamon Grenada has lovely vistas. The suite exceeded our expectations. We also had a tour of some of the other accommodation options during our stay, including the Luxury Villas, Luxury Hacienda Suites and the Garden Suite. Some of these villas have full kitchens with 2 bedrooms set over 2 levels, and are almost 1,000 square feet – perfect for longer stays, or group stays. As with our room, the other accommodations offered panoramic views, and bright Caribbean colours. ☞ Click here to see the various accommodations, reviews and prices for Mount Cinnamon Grenada. I don’t think there could be a better location for staying in Grenada. Mount Cinnamon is set on the road that links the island’s most beautiful beach (Grand Anse) to the second most beautiful (Morne Rouge, or BBC as the locals call it). Within a few minutes walk, you could be lazing on one of two white-sand beaches – just take your pick. The property is just a few minutes walk to the best restaurants and the biggest grocery store on the island, IGA. If you’re staying in one of the villas that has a kitchen, having a grocery store nearby is a major bonus. Plus, prior to your arrival, you can arrange for the staff to pick up some necessities from IGA for you. Just send them an email, and they will sort it out. Even though I still recommend taking the bus a couple of times, or renting a car to explore the island, you can reach everything you need within a 15 minute walk from Mount Cinnamon. 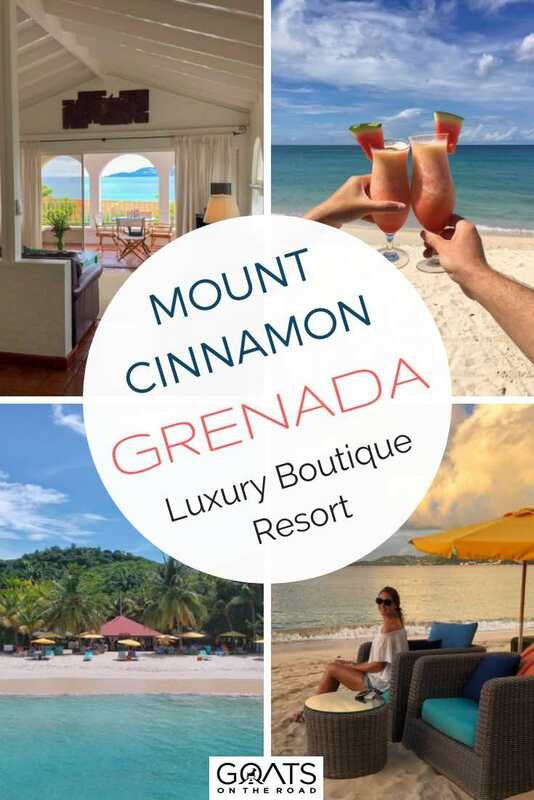 This is where Mount Cinnamon Grenada truly excels. When travelling, it doesn’t matter how nice the accommodation is, if the staff aren’t welcoming or friendly, your holiday will be ruined. Luckily, you can expect incredible hospitality here and, thanks to the staff, our stay was a very memorable one. From the receptionists and bartenders, to servers and house keepers, everyone made us feel like family. Not only did they know our names, but the servers remembered what we had ordered the night before. During our entire stay, we were constantly asked if we needed anything. Even the General Manager, Mark, takes the time to chat with each guest, while answering any questions they may have and offering them advice about the island. Although the people of Grenada are extremely friendly, we’ve actually found that service can be hit and miss on this island. Mount Cinnamon’s staff was an exception. The service was quick and friendly and every single one of them greeted us with a smile and treated us with care. Before staying at Mount Cinnamon, we had already enjoyed meals at the Savvy Beach Cabana Restaurant a few times. Due to the location and the cuisine, this is probably our favourite restaurant in Grenada for a relaxed lunch or a fun Friday night dinner. 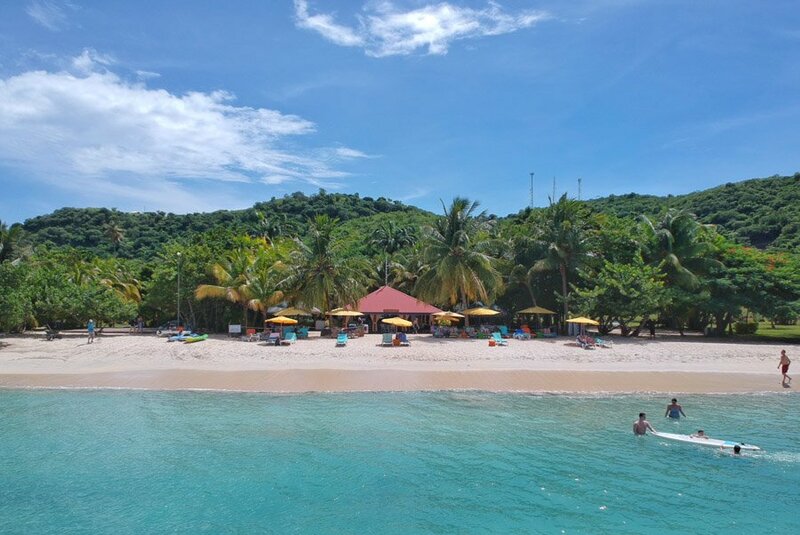 Even though Grenada has miles of stunning coastline, there are actually very few places on the island where you can eat a meal while your toes are submerged in the sand. Savvy Beach Cabana is one of these places and the food and service is excellent . 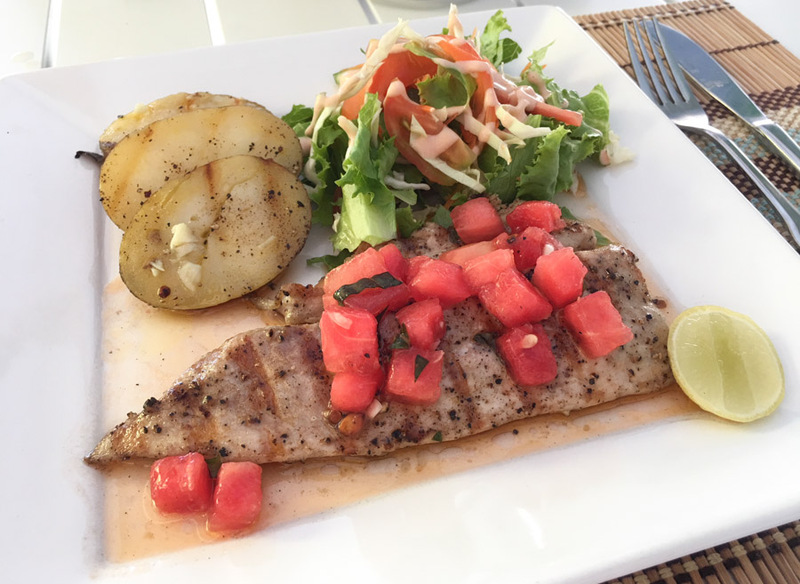 Try the grilled-to-perfection catch of the day with a side of breadfruit, plantain and watermelon salsa, the juicy grilled chuck burger with fries, or (when in season) the lobster linguine with parmesan. Divine! Friday is the only day of the week when dinner is served at the Beach Cabana. On this night they serve up BBQ with a side of steelpan music and s’mores cooked over a bonfire! Don’t miss Friday’s here. Outside of Friday nights, the Beach Cabana is only open for lunch and drinks from 10:00am to sundown. The Beach Cabana isn’t the only restaurant in Mount Cinnamon though, the Savvy’s restaurant is in the main common area of the hotel, next to the pool and with fantastic views over the water. This is where breakfast and dinner are served. A daily buffet and à la carte breakfast is included in the room rate and is served in this dining area. If you want to have dinner during your stay (and I recommend you do), stop by the restaurant and enjoy a candlelight meal and a menu featuring seasonal ingredients. 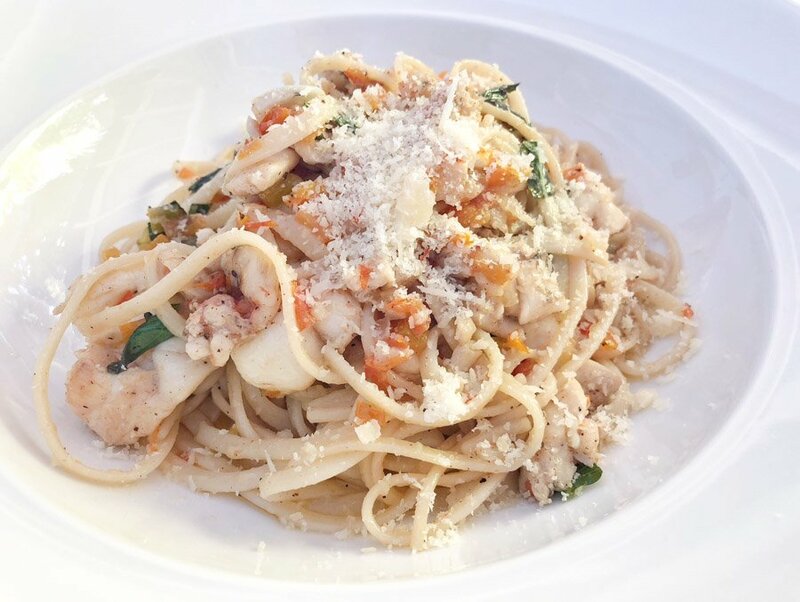 Try the breadfruit soup and seafood pasta. The meals we ate here were tasty and portion sizes were not pretentious whatsoever. I found the service at both Savvy’s restaurants to be amongst the best on the island for sure. The staff remembered my order from the previous night and said things like “Would you like the seafood pasta again or do you want to go for the steak tonight?”. That extra attention to detail blew me away and made it fun to interact with the wait staff in a personal way. The staff at Mount Cinnamon are also very passionate about their island and the Grand Anse area and love it when their guests explore. If you’d like to head to other nearby restaurants or rent a car to explore further afield, just ask them. 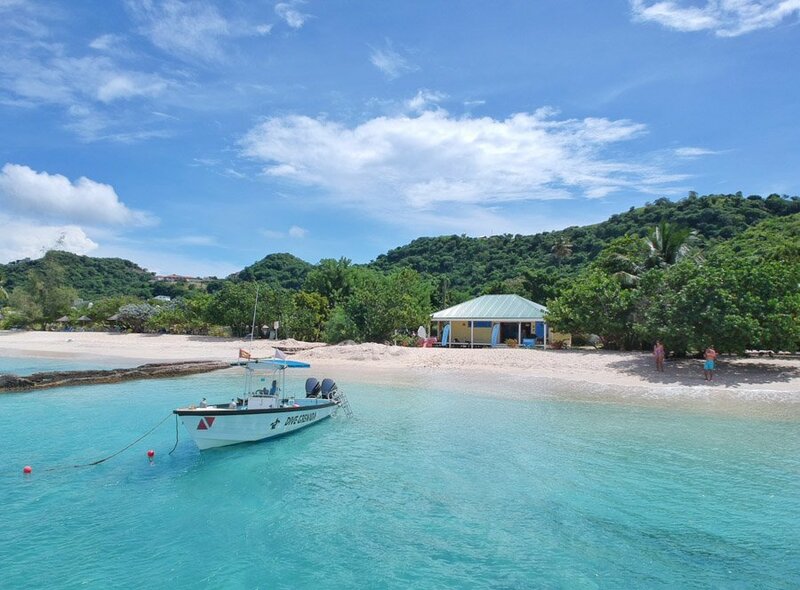 One of the major bonuses of not staying in a cookie-cutter all-inclusive resort is the opportunity to have local experiences while in Grenada. Get out there! There is no shortage of facilities and activities to enjoy while staying at Mount Cinnamon, most of which are included in the room rate. 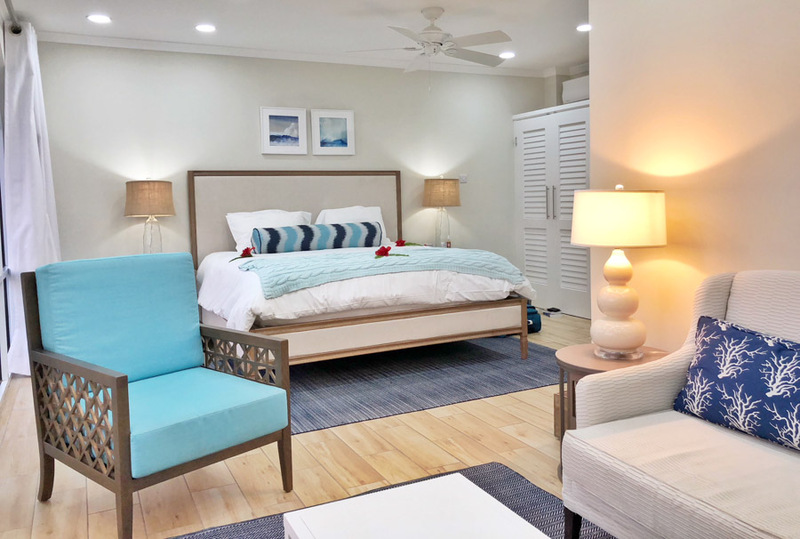 Guests have access to both restaurants, a large pool with a mini waterfall, shuffleboard, croquet, hobie cats, stand up paddle boards, snorkel gear, beach volleyball, tennis and a fitness center. For a full mind, body and soul experience, head into the yoga studio for Hatha, Vinyasa flow or Pilates. You’ll never be bored here. During our stay, Dariece and I enjoyed kayaking along the coast while seeing a different perspective of the beach, and we played our first game of shuffleboard. Turns out, it’s actually a lot of fun…although, I lost to both Dariece and a member of staff. 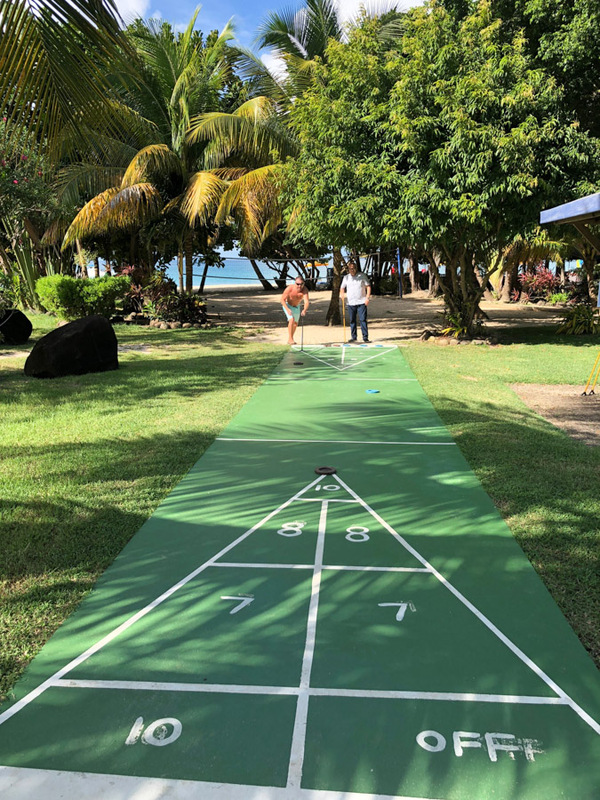 Set in a massive green garden, the games are open for all guests of the hotel and there’s usually enough shade that you can play at any time of the day. To add even more relaxation to your holiday, you can soothe your achy muscles during a spa treatment, which can be enjoyed in an air-conditioned room, or in an open-air cabana on the beach for an extra fee. Various full body massages are available, plus facials, manicures and pedicures. Well-manicured grounds at Mount Cinnamon – perfect for playing bocce ball or croquet! Dive Grenada is attached to Mount Cinnamon Hotel and has long been my go-to dive shop on the island. Ever since we first visited Grenada back in 2014, I’ve loved scuba diving with Phil, Helen and their team of excellent dive instructors. The newly built, wooden dive shop fits perfectly into the natural landscape of the area. I decided to join a dive on our last day at Mount Cinnamon and it was spectacular. The visibility was great and as always, the service at the shop and on the boat was professional, safety-oriented and welcoming. I’ve dove with Dive Grenada so many times that I have a pretty good rapport with the crew. We always have some good laughs on the boat in between dives as we munch on biscuits and sip juice. While under the water, Cojack, Brittney and Shyheim always seem to spot the sea creatures I’m looking for. 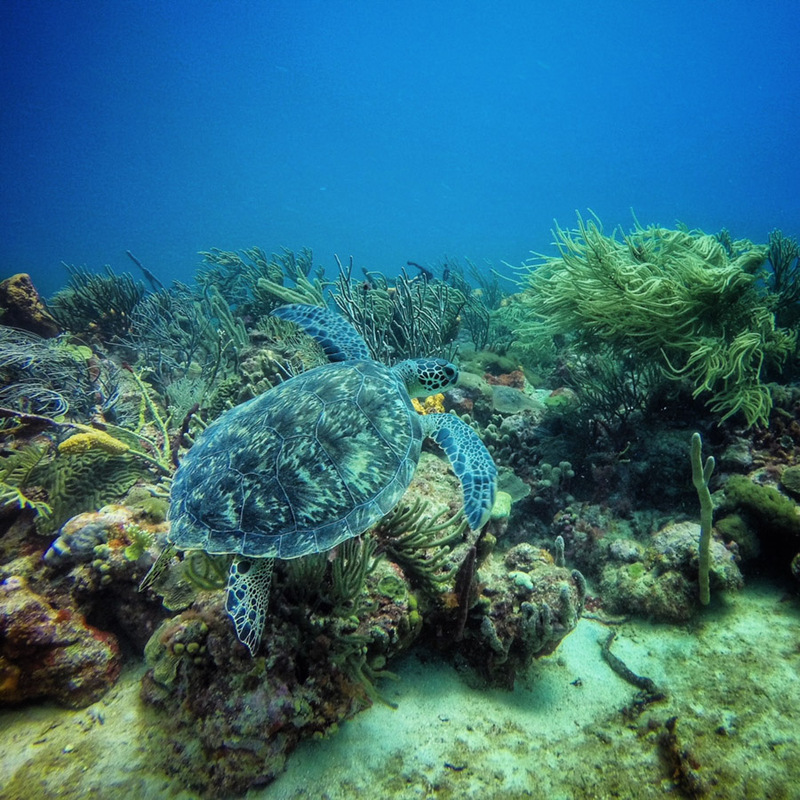 Apart from some incredible shipwrecks, you can expect turtles, rays, fish and of course, don’t miss a trip to the Underwater Sculpture Park. If you stay at Mount Cinnamon, or anywhere on the island, I recommend diving with Dive Grenada, the 5-star Padi shop on the Isle of Spice. Tell Phil and the crew that the Goats sent you! 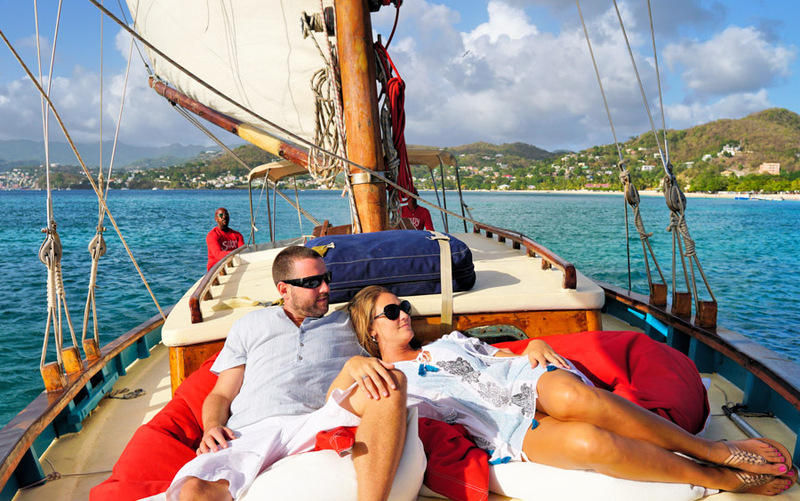 Mount Cinnamon also works closely with Savvy Sailing Charter and Tours, a locally owned sailing outfit that offers day trips with snorkelling, sunset sails, overnight cruises and multi-day sailing adventures to neighbouring Carriacou and the nearby Grenadines. There are a few boats in the fleet, but the original Savvy boat is a traditional sloop made in Carriacou and offers visitors a chance to experience sailing aboard one of these authentic, local vessels. We’ve been aboard the colourful Savvy many times and we love it. 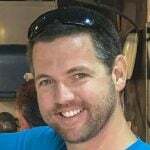 The owner, Danny, is one of our close friends and his staff are professional, knowledgable and welcoming – many of them are boat builders themselves. If you’re staying at Mount Cinnamon, be sure to ask them about Savvy sailing tours, or you can check them out on their website to book a trip. Again, tell Danny the Goats sent you! We always try to add in some pros and cons to our accommodation spotlight articles and if you’ve read previous ones, you’ll know that sometimes we’re brutally honest. If we aren’t honest in these Accommodation Spotlight articles, then there’s no point in reading them. We want to share our real experiences on this blog and that will never change. The truth is, we had a really hard time thinking of any cons for Mount Cinnamon Hotel, but plenty of pros. Like I said, it was hard to think of any negatives for Mount Cinnamon. Our experience was overwhelmingly positive and we’d love to return here one day. Our stay was romantic, relaxed and memorable. We’ll be dining at both the beach cabana for lunch and Savvy’s restaurant for dinner for sure, I must have another one of those perfectly prepared lobsters before the season ends! If you’re planning to visit the Isle of Spice, be sure to subscribe and check out our Grenada section where we cover everything about living and travelling in this beautiful Caribbean paradise. For more about Mount Cinnamon and to book a room, click here. Our favorite rum punch on the island was at Umbrella’s Beach Bar. Between one of the waitresses and the owner, we got an idea of the secret recipe, and now we make it at home when we’re missing Grenada! Special ingredient? Nutmeg syrup! Available from the IGA! Nutmeg syrup in a rum punch?! oooo, interesting! I love how each rum punch is a bit different from the next. Nicely written article and great to see a video again. Looks like a gorgeous place. We enjoyed a delicious meal at the Mount Cinnamon Restaurant a few weeks back. Your post has made us want to stay there! The rooms there look absolutely divine! Thanks for reading and commenting! The food at the restaurant(s) is amazing You’ll definitely have to book a stay – and also check out the private candlelight dinner!